I think, if you’ve read (and loved) the Harry Potter series, it’s impossible to look at a space under a staircase and not think of a certain dark-haired, glasses-wearing boy with a lightning bolt scar on his forehead. I know I’m always enamored of the under-stairs crawlspaces and storage areas at friends’ houses, remembering my first introduction to a certain fictional character, and his “room” in a cupboard on Little Whinging. So, it’s only natural for me to dance about excitedly and imagine making a little reading nook while painting said under-stairs area in my own house, right? Because that’s exactly what I was doing this weekend. The saga that is the cleaning and clearing out of the basement continues, though not as much has happened this past week as I would have hoped. (I did get some home improvement work done this Friday, on my day off, but it mostly involved the disgusting task of snaking the clogged shower drain upstairs. Ick.) 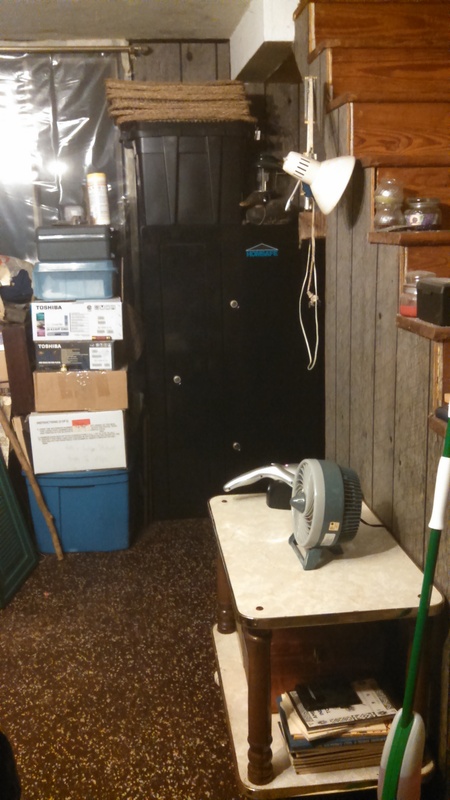 Of course, the main impetus for starting the massive undertaking that is the basement was – if you remember – the fact that we were going to need to get an electrician to come in and take a look at our fuse box, and see if he could fix the air conditioning. That is no longer necessary, as I fixed it myself. 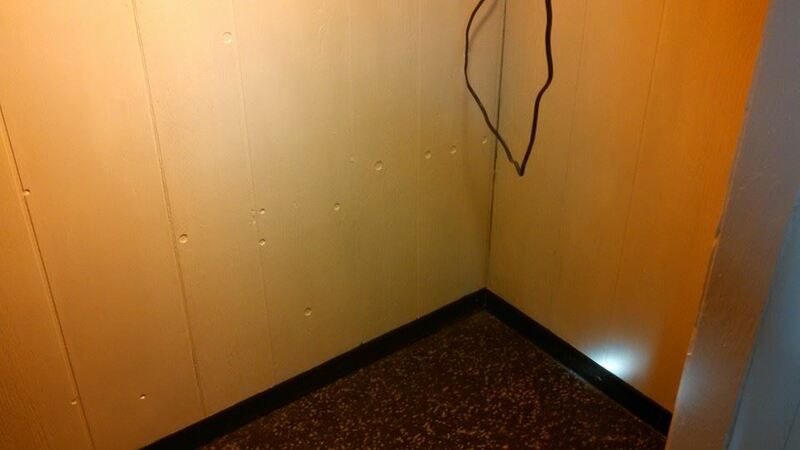 The before shot – the walls look less spooky in this lighting. and do something in the basement this weekend. We painted a small part of it. A very small part, as the main room of the basement is rather sizable, with a lot of wall space to cover. I’ve been wanting to paint at least a small section of it for a long time. The crappy wallboard that lines the entire main room (and a portion of my old bedroom) is way too dark for a basement that doesn’t have a lot of lighting in it to begin with. The dark gray wood just seems to absorb any and all light. One of the cheapest and easiest things you can do to change a room is buying a can of paint, and changing at least one of the walls. So that’s what we did. I already had a can of paint leftover from when I painted my room years ago. It’s a nice light yellow called “Sunny Meadow.” We pulled the can out from the laundry room, Robert taped off the wood trim and set out the dropcloth, and we opened the can…. …to find some pieces of rust from the inside of the can, and to see that the paint had separated pretty definitively. All of the pigment was at the bottom, with a 1″ layer of some kind of paint component floating on the top. We stirred it a little, and it was just like white washing the walls. Robert grabbed a screwdriver and really stirred the paint, though, and it was fine. We started out with two coats on the wall below the stairs. That was really all I intended to do. Just a little spot of color, to help brighten up a portion of the basement, and give me hope that we can tackle the rest of it. Ready for a Harry Potter house guest. We didn’t stop there, though. As we looked at it, we decided that we really should pain the area under the stairs, as well. After all, it’s not a big area, and the under-stairs area looks pretty dark and scary with the wall board, and it would really make it easier to work on the fuse box if that corner felt a little brighter, and if we go ahead and paint it now, we’ll be more likely to keep that area nice and neat…at least, that was our reasoning. 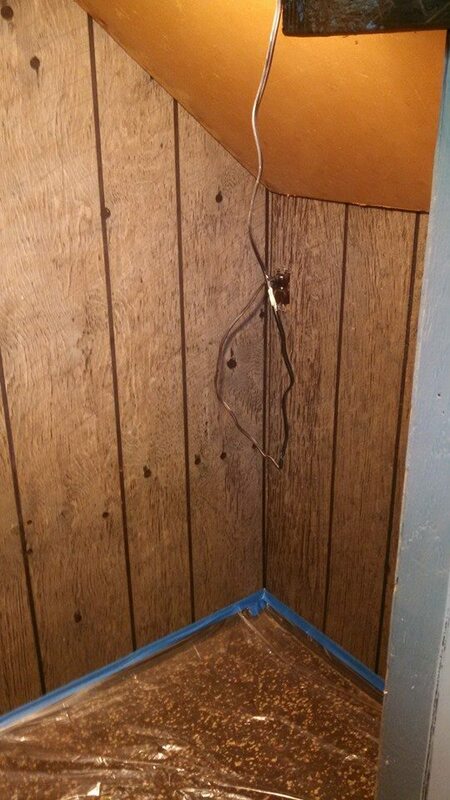 So we went ahead and painted the portion of wallboard under the stairs, as well. We stopped where the side wall meets the back wall. I want to paint the rest of the basement a different color, and that seems like the corner where the other paint color will need to start. Just that little bit of yellow has made the corner of the basement a cheerier place. The cats seem to like it. Raven keeps wandering over into the alcove, meowing at me to follow. I like to think he’s waiting for Harry Potter, too. 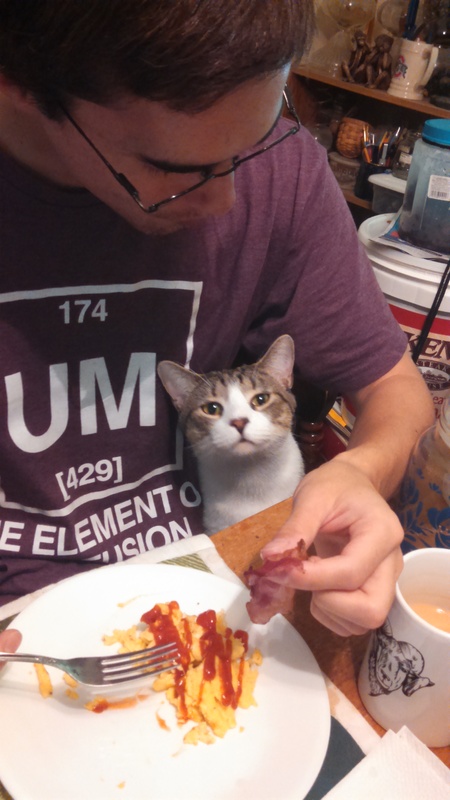 Here’s a totally unrelated picture of Alvin trying to steal bacon, for your enjoyment.